I believe this BLT is better than the original that is made on toast. So simple, easy and delicious. Microwaving the bacon is an easy cooking method. You may want to make a double recipe as you probably can’t eat just one. Place half the bacon on a double paper towel-lined plate. Top with another layer of paper towels and place the other half of the bacon on top and then put another layer of paper towels on that. Microwave until crispy, 8 to 10 minutes. Put mayonnaise in a large bowl and add tomatoes and lettuce and toss to coat evenly. 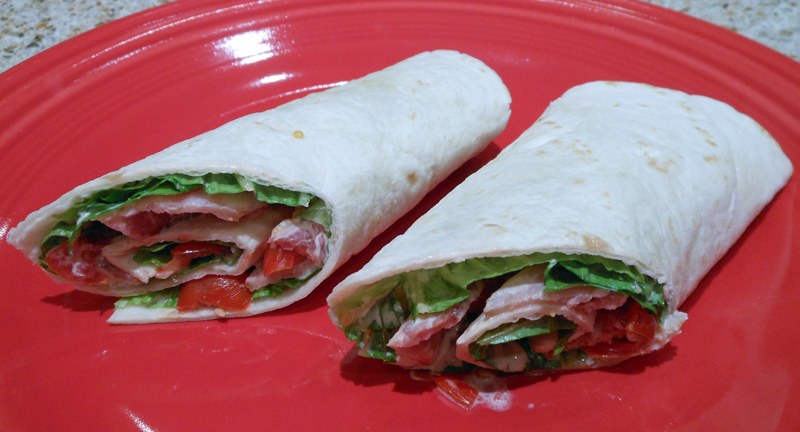 Lay tortillas on counter and divide lettuce, tomatoes, and bacon among tortillas. Roll tightly and serve.